Caulerpa lentillifera is a plant of many names, and not just because its scientific name is hard to pronounce. 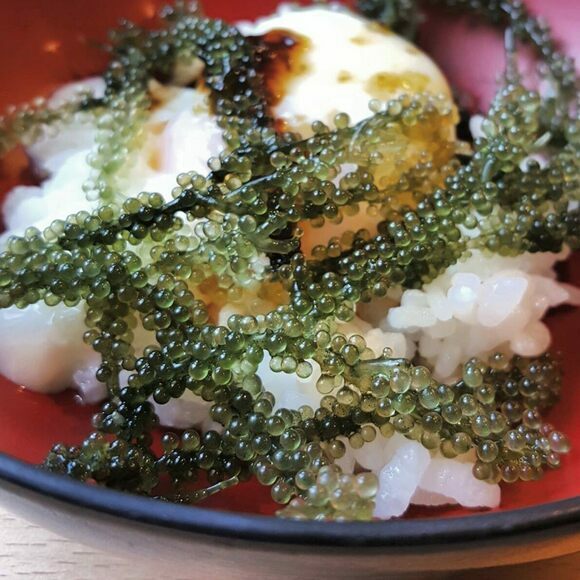 Across Japan and Southeast Asia, various cultures incorporate this bubble-fronded seaweed into their diets. In Japan, it goes by umi-budō, meaning “sea grapes.” Sea grapes are called “green caviar” in English, because the string of shiny pearls “pop” upon eating—much like munching on a frond of roe. In the Philippines, you might hear the same seaweed referred to as latô or arosep; in Sabah, Malaysia, it’s known as latok. One noteworthy nickname the sea grape has earned is “longevity seaweed.” In the Japanese prefecture of Okinawa, locals dine on healthy helpings of umi-budō and live longer than most people on Earth. Due to increased awareness of diet’s role in lifespan, the sea grape has made waves in the international health food industry. Customers (and marketers) love its low calorie count, medicinal properties, and nutritional profile—rich in minerals and vitamins A and C.
Sea grapes are commonly used in salads, as garnish for sashimi, and as a topping for rice bowls and noodle dishes. Its briny, seawater flavor is said to pair well with soy sauce or vinegar; it’s often eaten fresh with vinegar. More of a sweets fan? In Okinawa, you can try umi-budō ice cream—a great way to reap the benefits of the sea grape’s potentially life-extending powers. Sea grapes are primarily served in Japan (particularly Okinawa), Malaysia (in Sabah), and the Philippines. You can find them in both restaurant dishes and markets. Don't confuse these sea grapes with sea grapes that come from tropical trees (Coccoloba uvifera). The Aztecs used it to make protein-rich tortillas; we use it to make unicorn lattes. Drinking algae has never been sexier.